If you were to take something for insomnia, what is the last thing you would want to hear about it? You would want to know it was safe, of course, but you would also probably like to know that it would be effective. 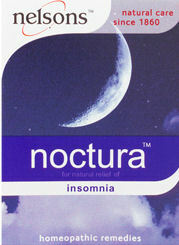 I therefore have to congratulate Nelsons Homeopathic Pharmacy for the extreme honesty shown in the description of their Noctura insomnia relief product. We all know that homeopathy is a fraud and properly prepared homeopathic "medicines" don't do anything, least of all that which they are supposed to treat. It is not often, however, that the admission of inefficacy is shown right there in the product information. "Does not cause drowsiness"! "Does not cause drowsiness"! Of course it doesn't, because it does nothing, but this is a pretty damning, silly thing to put on a packet of insomnia relief tablets. I can't help myself, I just have to say it again: "Does not cause drowsiness"!